What did our recent usability study reveal about reading books on an iPhone? The results might surprise you. You may have seen some of these proclamations in the media and on Twitter or blogs. But what’s the real story with using your iPhone as an eReader, and which eReader is the best? As a publisher of books in general – and technology books in particular – we wanted some answers, so we set out to conduct usability tests on what people thought of eReaders on the iPhone. Our plan was to use the results from this usability study to inform the development of our own next generation eReader, and to understand what features of other popular ereaders that our customers cared about most. We wanted to learn if people really use iPhones to read books and what that reading experience was like. We decided we would do our testing during the Voices That Matter iPhone Developers Conference, held April 24-25 in Seattle, Washington. For our iPhone eReader usability study, we wanted to pick a book that the conference attendees were probably familiar with and may have already read in print and on their iPhone, so we chose Aaron Hillegass’s book, Cocoa Programming for Mac OS X, Third Edition. We considered testing reading habits with the iPad too, but decided the iPad was too new and not enough people had used it to make a fair comparison. For the usability test, we interviewed seven people. 6 of the 7 people had used eReaders on the iPhone, and most used the iPhone to read technical books/text books, not fiction or other subjects. Their average age was 42, they had owned an iPhone for at least 2.4 years, and used their iPhone at least 7 hours per day. When asked how technical they were on a scale of 1 to 10, they rated themselves a 9.1 (with 10 being the most technical). People said they read books deeply with their iPhones — if not cover-to-cover, then at least a chapter at a time. 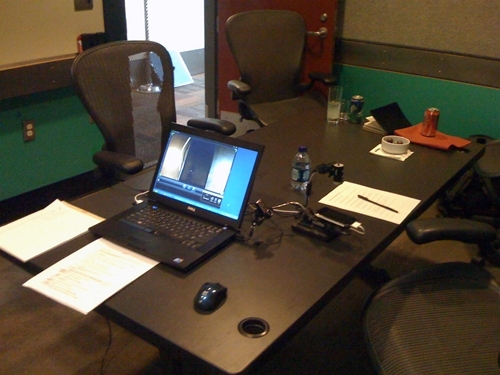 We then moved on to the testing portion of the usability test, where we recorded their verbal responses, facial movements, and finger tracking. See Figure 1 for the testing setup. Going in to the testing, most subjects said they liked the Kindle eReader the most; however, after testing, most subjects said they preferred the Stanza eReader. Respondents showed that easy navigation around a book was the most important feature to them. They wanted a table of contents that is linked to the first page of any chapter to more easily navigate big chunks of content. Once they got to first page of a chapter, they wanted to flip pages forward and backward, just as they would with a print book. They much preferred horizontal page turning to vertical scrolling. They valued creating, finding, and deleting bookmarks. While all eReaders were good at creating and finding bookmarks, respondents thought Stanza was superior in deleting bookmarks. Being able to change font size was valued very much, but changing typeface was not considered a priority. They expected the publisher or developer to pick the best typeface for them. In other surveys we have seen, people said they do lots of their reading at night (either in bed or while others are watching TV). Not surprisingly, one feature that respondents liked most about Stanza was the ease of switching the iPhone to Night Theme. 6 of 7 respondents had purchased and received an iPad by the date of this testing. All said that going forward, they expected to do more of their technical book reading on an iPad instead of an iPhone. They forecasted that they will continue to use their iPhone to dip into ebooks they already own and use the “search” feature to find specific passages they are looking for. There are no easy, accurate conclusions to draw such as “books are dead.” Rather, in certain subject areas, customers want to access helpful and practical written information, provided in a wide variety of digital formats that they can read using a number of devices. Some still prefer to read ebooks in a similar way that they read print books. Customers generally like Stanza, but are still looking for an even better reading experience. Early adopters of iPhones liked reading books on iPhones, but plan to do most of their deep reading on iPads in the future, using the iPhone for quick searches across books. If you’re interested in conducting your own usability tests, but don’t know where to start, we highly recommend Rocket Surgery Made Easy by Steve Krug. His basic premise is that lots of quick and fast tests yield better results than no tests, or waiting forever to do a few big tests, and that training to run basic tests is not that much work. All the details you need to start usability testing are included there. John Wait is EVP at Pearson Technology Group in charge of digital initiatives. Enlie Wang, Ph.D., completed his doctoral work in User Experience research at Purdue University in 2005, and is a leader within Pearson’s Learning Technology Group’s User Experience team.